The National Comedy Center in Jamestown, New York – iconic comedian Lucille Ball’s hometown – is close to being designated the official “National Comedy Center” of the United States. US Senate Minority Leader Charles E. Schumer included a provision in the 2019 Lands Package that called on The Comedy Center, located in downtown Jamestown and built in-part to honor the massive national impact of Jamestown native Lucille Ball, to serve as America’s official center of comedy and its rich history in our nation. Schumer said this official congressional designation will help solidify the facility as a civic landmark and cultural institution, and the premiere “National Comedy Center” of the United States, and called on his colleagues in Congress to pass the Lands Package as soon as possible. The 2019 Lands Package includes legislation from Senator Schumer that will formally designate the National Comedy Center as the ‘national’ comedy center. Schumer noted that this designation will allow the center to build on the success of other Upstate New York tourist attractions like the National Baseball Hall of Fame and Museum in Cooperstown, NY. The National Comedy Center employs 38 people and has created nearly 200 spin-off jobs and is projected to have a $23 million impact on the region. Currently, the annual comedy festival hosts about 20,000 people and has been visited by famous comedians like Jerry Seinfeld, Joan Rivers, Jay Leno, and Nick Offerman. Schumer said this designation is vital to the center’s continued growth, and pointed out that Jamestown’s National Comedy Center is the only museum of its kind with the mission of preserving, protecting, and showcasing the art of American comedy and its role in our culture. “The National Comedy Center is committed to Lucille Ball’s vision for her hometown of Jamestown, New York to honor comedy’s great minds and unique voices in ways that educate, engage and inspire future generations. With visitors who’ve already come from all 50 states since our opening last August, we truly are the nation’s museum for the celebration of comedy. We thank Senator Schumer for everything he’s done to make the National Comedy Center a reality, and welcome this official Congressional designation in 2019,” said Tom Benson, Chairman, National Comedy Center. “As the country’s first national-scale museum and cultural institution dedicated to presenting, preserving and celebrating the art form of comedy, the National Comedy Center — and Comedy — is deserving of this important recognition by Congress. We are grateful to Senator Schumer for his tremendous support and look forward to the bill’s passage in both the Senate and the House in the coming weeks,” said Journey Gunderson, Executive Director of the National Comedy Center. The National Comedy Center, located at 203-217 West Second Street in Jamestown, New York, pays tribute to the art of American comedy through all eras, mediums, and genres. The 37,000 square foot, $50 million facility tells the story of comedy from its origins through the present, with more than 50 immersive, interactive exhibits. As of January 2019, the National Comedy Center has already attracted visitors from all fifty states and nine countries total. It was also recently named the second “Best New Attraction in America,” by USA Today. Each visitor experiences a personalized trip through the Center as exhibits reflect one’s personal comedic sensibilities via use of a bracelet fitted with an RFID chip worn throughout the stay. Highlights of the collection include George Carlin’s massive personal archives that provide a glimpse into one of comedy’s most prolific minds, a hologram theater that presents performances of some of comedy’s most notable figures, and experiences that allow visitors to step into the shoes of a stand-up comedian. Additionally, the National Comedy Center features rare artifacts from some of comedy’s greatest names. In 2018, Senator Schumer helped deliver one such artifact, as a customs snag threatened to delay the arrival of a vintage Harley-Davidson motorcycle that was donated to the NCC by Dan Aykroyd. Design of the museum and the repurposing of Jamestown’s original 1930 art-deco Gateway Train Station was provided by some of the most prominent cultural and interactive design firms in the world, whose portfolios collectively include the award-winning 9/11 Memorial Museum, the National Underground Railroad Freedom Center, the College Football Hall of Fame, Saturday Night Live: The Experience, Universal Studios, and more. The Center celebrates comedy in all of its forms, educating and engendering in visitors an appreciation for the art form and its artists. The National Comedy Center opened in 2018, and ground was first broken on the project in 2015. Schumer noted he pushed a resolution in March of 2018 to formally recognize the National Comedy Center. Schumer also noted his successful push for $1.7 million from the Economic Development Administration, and $5M in net benefit due to New Market Tax Credits. In addition to this federal funding, the National Comedy Center has also received $10M from NYS, and private donations from the Gebbie Foundation, the John R. Oishei Foundation, the Ralph C. Wilson Jr. Foundation, the Lenna Foundation, Chautauqua Region Community Foundation, the Ralph C. Sheldon Foundation, the Johnson Foundation, and the Jessie Smith Darrah Fund. Schumer said the National Comedy Center shines a spotlight on Jamestown as a global comedy destination. Set on a perfect perch overlooking some of the Dolomites’ most majestic mountain peaks, ADLER Lodge Ritten will be an ideal holiday for those looking for laid-back luxury. Lichtenstern, Italy – On a sunny plateau known as Renon, a popular weekend getaway for city dwellers, a new hideaway from the ADLER Hotel Group is taking shape: ADLER Lodge Ritten. Some destinations simply cast a spell, touching your spirit and staying in your heart, and ADLER Ritten promises to do just that. The intimate lodge will be a sister to celebrated hotels like ADLER Spa Resort Thermae in Tuscany and Dolomite properties ADLER Lodge Alpe, ADLER Spa Resort Dolomiti and ADLER Spa Resort Balance. Set on a perfect perch overlooking some of the Dolomites’ most majestic mountain peaks (such as the Rosengarten and the Latemar), ADLER Lodge Ritten will be an ideal holiday for those looking for laid-back luxury. Set in a remote glade in Lichtenstern between Oberbozen and Klobenstein, the owners have designed the lodge as “a place of peace and deceleration.” Reachable only by a single limited-access road, the hotel is surrounded by forest, with incredible mountain views that make guests feel like they’ve entered another world. Visitors won’t need a car to get around, as Renon’s historic narrow-gauge railway, the Rittnerbahn, stops just 200 meters from the hotel at the Stella station. When they’re ready to explore the thriving city of Bolzano, it’s just a 12-minute ride away via cable car. Activities are designed to highlight the distinctive beauty of each season and might include skiing, snowshoeing, Nordic walking, wine tasting or cycling (the hotel offers complimentary electric-bike rentals). Bolzano’s worthy cultural sites include the South Tyrol Museum of Archaeology, the 13th-century Mareccio Castle, and the Duomo di Bolzano cathedral. ADLER Lodge Ritten will consist of a spacious main building with reception area, lobby, bar, restaurant and spa. There will be two additional structures for guest accommodations, each with ten junior suites. Also scattered throughout the property will be 20 one- and two-story chalets, some set around a small natural lake. All rooms will have private bio saunas and either balconies or terraces, and chalets will also feature wood-burning fireplaces. All meals, soft drinks, wines and spirits will be included in the room rate, and chef Hannes Pignater is planning to spoil guests throughout the day with menus that focus on regional and local products. There will be breakfast featuring local farm specialties; a lunch buffet of snacks and typical South Tyrolean dishes; and exquisite, multi-course dinners in the restaurant, which will have a panoramic view of the evening sky. The spa will face the impressive Schlern peak and offer incredible Dolomite views, through large glass windows. Customized face and body treatments will incorporate extracts, oils and other products from the ADLER care line, which combines natural cosmetics and the latest technology. Guests will be able to choose among three saunas: One classic steam sauna in the main building, as well as two saunas located deep in the forest, giving visitors a chance to truly immerse themselves in nature. The heated infinity pool will be open year-round. The Sanoner family has been in the hotel business since 1810, when they opened their first small inn, and the five Adler hotels are currently managed by the family’s seventh generation Along with ADLER Lodge Ritten, there are three spa resorts in Italy’s Dolomites mountain region and one in Tuscany. All ADLER Spa Resorts are renowned for providing not only relaxation and beauty services, but also modern western medicine and alternative healing methods. For guests wishing to delve deeper into improving their health, there are also two ADLER MED medical competence centers, one at ADLER Thermae in Tuscany and the other at ADLER Balance in the Dolomites. Each has its own team of doctors from disciplines like general medicine, laboratory medicine, aesthetic medicine, modern Mayr medicine, homeopathy, herbal medicine and nutrition. Jade Mountain’s high-rise vistas of The Pitons are breathtaking. Naming St. Lucia’s iconic Jade Mountain the number one “Best Hotel in the Caribbean”, U.S. News & World Report rhapsodized about the resort’s high-rise vistas of The Pitons, with architecture that draws on St. Lucia’s natural beauty, and referenced the varied list of island sports, including snorkeling in its sister resort, Anse Chastanet’s clear waters, sunset sailing on the resort yacht and scuba diving with experts from the on-site PADI dive center. Turning to Jade Mountain’s sister resort, U.S. News & World Report reported that Anse Chastanet, spread across 600 tropical acres, is flanked by two sandy beaches. The resort’s 49 rooms are either perched on the verdant hillside or nestled beach level within a tropical garden.” The resort was rated number 49 in the world. The media outlet reported recent guests loved the relaxing, natural setting and their access to a host of activities, from yoga to jungle biking, and scuba diving in a marine reserve offshore. “To round out this nature-inspired retreat, travelers have their pick of five dining options, including one inside a treehouse,” they noted. Meanwhile, Islands magazine declared Jade Mountain winner of its Readers’ Choice in its list of the top luxury all-inclusive resorts of the world, while Big 7 Travel, the global travel site, listed the resort among the world’s “50 Most Romantic Hotels in the World.” Big 7’s Top 50 list positioned Jade Mountain as number six in the world. With only 78 rooms in total between the two sister resorts, the company employs more than 550 team members, 97 percent of whom are from the surrounding communities. Anse Chastanet is set amid a lush 600-acre estate with two soft-sand beaches and breathtaking views of St. Lucia’s twin Pitons mountains, the UNESCO World Heritage Site. Amidst St. Lucia’s lush tropical beauty, activities range from jungle biking, hiking and bird watching to snorkeling on the reef within swimming distance of the beach. The environmentally friendly, award-winning resort comprises 49 individually designed rooms, 37 of which are scattered about a lush hillside, and 12 that are nestled within a tropical garden at beach level. It offers innovative menus, one entirely vegetarian, in four different locations and features fresh produce served up from the resort’s organic farm. Guests can take in interactive chocolate-making classes in the resort’s chocolate laboratory and a variety of water sports are also on offer. For more information, visit www.ansechastanet.com. Rising majestically above the 600-acre beachfront resort of Anse Chastanet, Jade Mountain Resort on St. Lucia’s south-western Caribbean coastline is a cornucopia of organic architecture celebrating St. Lucia’s stunning scenic beauty. Architect owner Nick Troubetzkoy has expanded upon his philosophy of building in harmony with Caribbean nature in his creation of Jade Mountain St. Lucia. The bold architectural design – individual bridges leading to exceptional infinity pool sanctuaries and rugged stoned-faced columns reaching towards the sky – makes Jade Mountain one of the Caribbean’s most mesmerizing resort experiences. For more information, visit www.jademountain.com. The National Comedy Center opened August 1, 2018 in Jamestown, New York as the nation’s first state-of-the-art museum dedicated to sharing the vital story of comedy in America. Based on the vision of Jamestown native Lucille Ball for her hometown to become a destination for the celebration of comedy, the National Comedy Center showcases comedy’s great minds and unique voices, from Charlie Chaplin to David Chappelle. Jamestown, New York –The National Comedy Center, the nation’s first museum and visitor experience dedicated to the comedic arts, announced today that Sebastian Maniscalco and John Mulaney will headline the 2019 Lucille Ball Comedy Festival, August 7-11. Tickets for their performances are now on sale at www.ComedyCenter.org. Many festival events have yet to be announced, in a lineup that will celebrate comedy’s contemporary stars, rising voices, and historic legacies. Sebastian Maniscalco and John Mulaney are two of the most popular and acclaimed comedians in the country in 2019 — Maniscalco breaking several comedy box office records over the past year, and Mulaney named “one of the best stand-up comics alive” by Entertainment Weekly. John Mulaney will be performing on Friday, August 9 and Sebastian Maniscalco will be performing on Saturday, August 10 in Jamestown’s Northwest Arena, adjacent to the National Comedy Center, a $50 million museum experience dedicated to comedy. Comedian, actor and best-selling author Sebastian Maniscalco has been called “one of the funniest comedians working stand-up today,” by Esquire Magazine, “one of the hottest comics,” by Newsday and “the comedian’s comedian” by People Magazine. Maniscalco can currently be seen with Viggo Mortensen in the Oscar-nominated “Green Book,” winner of three Golden Globes including Best Motion Picture – Musical or Comedy. Last November, Maniscalco won Billboard’s inaugural Comedian of the Year award. In 2019, Maniscalco will be starring in Martin Scorsese’s new film “The Irishman,” with Robert De Niro, Al Pacino and Joe Pesci. Before Emmy Award-winning comedian and writer John Mulaney was called “one of the best stand-up comics alive” by Entertainment Weekly, he began writing for “Saturday Night Live” in 2008, where he also appeared as a “Weekend Update“ correspondent and co-created memorable characters such as “Stefon” with Bill Hader. He has spent the past year touring the United States with his most recent show, “Kid Gorgeous,” which was released as a Netflix original special last year and won the Emmy Award for Outstanding Writing in a Variety Special. Mulaney has starred three previous stand-up specials. He has performed stand-up on “Jimmy Kimmel Live,” “Late Night with Jimmy Fallon,” “Late Night with Conan O’Brien” and “Comedy Central Presents.” In 2016, Mulaney starred in the Broadway hit “Oh, Hello” on Broadway alongside Nick Kroll. He can also be heard in the 2018 film “Spider-Man: Into the Spider-Verse,” which recently won the Golden Globe for best Animated Feature Film and has just been nominated for an Academy Award for Best Animated Feature Film. Additional Lucille Ball Comedy Festival events, including more than five comedy showcases, Late Night Comedy events, National Comedy Center Dialogues, and Lucy legacy events will also be announced atwww.ComedyCenter.org in the coming months. As an enhancement to this year’s Lucille Ball Comedy Festival, the National Comedy Center is once again partnering with the world-renowned Chautauqua Institution, located on nearby Chautauqua Lake, New York, for a comedy-themed week during the Institution’s summer season, which will run prior to the festival: July 29 through August 3. Events and speakers will explore how comedy changes us and, in turn, society, and the potential of comedy to change minds and influence decision-making. Programming details will be released in the coming months. For more information and reservations, visit CHQ.org. Last year’s Lucille Ball Comedy Festival featured the grand opening of the National Comedy Center and featured Amy Schumer, Lily Tomlin and a panel of original “Saturday Night Live” performers and writers including Dan Aykroyd, Laraine Newman and Alan Zweibel. The Lucille Ball Comedy Festival is presented by the National Comedy Center and embodies Lucille Ball’s vision for her hometown — Jamestown, New York, to be a destination for the celebration of the comedic arts and to showcase new comedic talent from around the country. The festival attracts over 15,000 attendees annually from nearly every state in the country, who come together to share laughter while honoring the craft and contributors on stage at dozens of venues throughout Jamestown, including the National Comedy Center and the Lucille Ball Desi Arnaz Museum. Now in its 28th year, the festival has featured comedy’s greatest stars and rising young comedians, including Jerry Seinfeld, Ellen DeGeneres, Trevor Noah, Lily Tomlin, Jay Leno, Amy Schumer, Brian Regan, Lewis Black, W. Kamau Bell, Jim Gaffigan, Paula Poundstone, Dan Aykroyd, Joan Rivers, Bob Newhart, the Smothers Brothers and more than one hundred other comedic artists. The National Comedy Center recently took second out of twenty “Best New Attractions” in the country, in USA Today. Condé Nast Traveler called the National Comedy Center “One of the best museums in the country,” while comedy website The Interrobang named the design team of the National Comedy Center second on its list of “Innovators Who Changed Comedy” in 2018. Visitors from all 50 states and nine countries have given the Center a rare 5/5 rating on TripAdvisor in just its first six months of operation. The National Comedy Center opened August 1, 2018 in Jamestown, New York as the nation’s first state-of-the-art museum dedicated to sharing the vital story of comedy in America. Based on the vision of Jamestown native Lucille Ball for her hometown to become a destination for the celebration of comedy, the National Comedy Center showcases comedy’s great minds and unique voices, from Charlie Chaplin to David Chappelle. As a non-profit cultural institution, the National Comedy Center was created with a $50 million investment, funded by a mix of federal, state and private philanthropic support, including partnership with I LOVE NEW YORK ™, Governor Andrew Cuomo and New York State’s Empire State Development. The National Comedy Center features exclusive collections and world-class exhibits that give comedy fans an unprecedented, behind-the-scenes look at the time-honed creative processes that have elevated comedy entertainment to an art form. Over 50 innovative exhibitions across 37,000 square feet of space enable visitors to take an interactive journey through comedy history, from early vaudeville to the latest viral memes. Cutting-edge personalization technology makes the entire experience unique. Throughout the experience, visitors gain a profound appreciation for comedy icons and innovators, as well as for the tremendous influence of humor on how we think, live and laugh. Design for the National Comedy Center was led by the most prominent cultural and interactive design firms in the world, whose portfolios collectively include the award-winning 9/11 Memorial Museum, The National Underground Railroad Freedom Center, The College Football Hall of Fame, SNL: The Experience, and more. The National Comedy Center also operates the Lucille Ball Desi Arnaz Museum, which explores the lives, careers and legacy of the “First Couple of Comedy,” and the incredible impact they had on the world. National Comedy Center, 203 W. 2nd Street, Jamestown, NY, 716-484-2222, www.ComedyCenter.org. Visit www.AppleVacations.com for a full list of participating resorts and other enticing offers designed to create lasting memories for the entire family without breaking the bank. Tour operator members of the United States Tour Operators Association (USTOA) named Italy the most popular or “hot” destination for travelers in 2019, in a recent survey conducted by PriceWaterhouseCoopers LLP (PwC). The top 10 “hot” destinations for the coming year also included Iceland, which ranked second, followed by Japan, Vietnam, Australia, France, Spain, Colombia, Cambodia and Portugal. USTOA tour operator members also identified their top 10 off-the-beaten path or emerging destinations that they see gaining popularity in 2019: Iceland ranked first, Cambodia ranked second, followed by Croatia, Colombia, Vietnam, Portugal, Bhutan, Bolivia, Myanmar, and Ethiopia. Demand for immersive, culturally rich travel programs continue to remain high. Roughly 82% of members offer art and culture travel experiences. The art and culture category was also the highest ranked experiential program for travelers in 2017, based on volume of sales. Two thirds of membership offer honeymoon and romance programs, 63% of members offer adventure programs, and more than half (56%) offer multi-generational family programs. According to the study, the tour operator members of USTOA project to close out 2018 with sales reaching $18.7 billion dollars, representing 9.8 million individual travelers. Furthermore, member operators are extremely confident about business in the year ahead: 100% of responding tour operator members anticipate growth in sales in 2019. Political instability and overtourism, a new category this year, were the next two global risks that members were “extremely concerned” about, as named by 13% of survey respondents. In addition, tour operator members projected that roughly 63% of total packages sold in 2018 were through travel agencies, “Reinforcing the critical role of travel advisors in the continued success of members’ businesses,” Dale cited. When asked whose traveling, tour operator members responded that about half (48%) of their customer base are 51 to 70 years of age. The next largest category was age 36 to 50 years representing 20% of customers. Gender is split evenly with 51% female and 49% male. Within the escorted/guided and custom tour category, female passengers were represented slightly higher at 59%. The research was released at USTOA’s 40th Annual Conference & Marketplace, held at the JW Marriott Phoenix Desert Ridge in Phoenix AZ, November 26-30, 2018. U.S. Tour Operators Association members, representing nearly $19 billion in revenue, provide tours, packages and custom arrangements that allow 9.8 million travelers annually access, insider knowledge, peace-of-mind, value and freedom to enjoy destinations and experiences across the entire globe. Each member company has met the travel industry’s highest standards, including participation in the USTOA’s Travelers Assistance Program, which protects consumer payments up to $1 million if the company goes out of business. As a voice for the tour operator industry for more than 40 years, USTOA also provides education and assistance for consumers and travel agents. KENNEBUNKPORT, ME– Paint the Town Red officially kicks off Saturday, February 2 at The Boathouse Waterfront Hotel’s “Frosted! A Freezing Good Time” Ice Bar celebration hosted by Portland, Maine native Chelsea Roy of The Bachelor Season 22 and Bachelor in Paradise. The Igloo Ice Lounge is open 4 to 8 pm Sunday through Thursday and 4 to 9pm on Friday and Saturday through March 31, 2019. 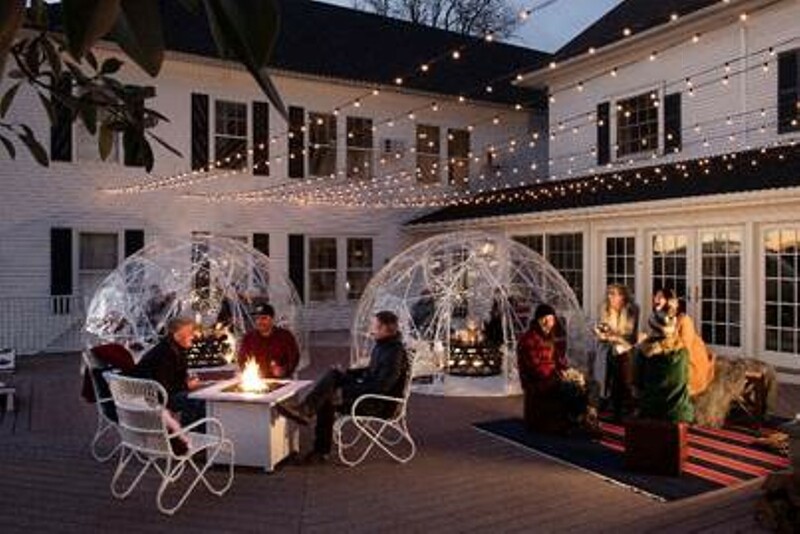 The Kennebunkport Inn is offering an Igloo Stay & Play Package, starting at $395 which includes a two-night stay at the Kennebunkport Inn, snowshoe rentals for two, an L.L.Bean boat tote filled with winter themed goodies and two complimentary Igloo Ice Lounge drink tickets. The package is available for travel through March 31, 2019 and can be reserved online or over the phone at 1(800) 573-7186. Cupid’s Love Shuttle can be booked for KRC guests needing transportation to and from the Portland International Jetport for $40 per person (one way). KRC guests can take advantage of the Love KPT hotel packages starting at $479 for a two-night stay, three course dinner, while the Put A Ring On It package puts KRC’s Cupid Concierge in charge of curating of a romantic proposal. The Cupid Concierge is available to curate a romantic rendezvous for couples staying at a KRC property throughout February and can be reached at cupid@lovekpt.com or 207-967-1517. The Love KPTpackage starts at $479 and includes a two-night stay at The Boathouse Waterfront Hotel, the Kennebunkport Inn or the Grand Hotel, arrival goodies of red wine and chocolate-covered strawberries, a three course dinner for two and late check-out. The package is available for travel through March 31, 2019 and can be reserved online the individual property’s website. For those looking for an over-the-top engagement, KRC’s Put A Ring On It puts the Cupid Concierge on speed dial to help curate perfect romance. Beginning with luxury accommodations, the package includes an original love poem, bottle of Dom Pérignon in Waterford crystal champagne flutes, a personal photographer to capture the “big ask,” four dozen red roses and chocolate covered strawberries. Plus, KRC recently partnered with luxury honeymoon travel specialists, CIRE Travel, who will waive all planning fees for couples (valued at $1,000) booking the Put A Ring On It package. To really ramp up the romance cupid can also provide a custom engagement ring (valued up to $8,000) from a local jeweler. Available through February 28, 2019, the package can be booked by phone at 1-(800) 573-7186. Saturday, February 16: Wine and Valentines at The Burleigh – Featuring three wine tastings paired with hors d’oeuvres; 1-3pm; $20 per person; $35 per couple. Saturday, February 23: Oyster Shucking Class at The Boathouse Restaurant – Hands-on shucking instruction with half a dozen oysters, wine tasting, education on oyster wine pairings, lights snacks and a keepsake oyster knife; 1-3pm; $45 per person. Saturday, February 16: Sushi Making Demo, Sake Tasting + Dinner at The Boathouse Restaurant – An interactive demonstration on the art of sushi making paired with light bites and sake tasting, a three course meal and sushi rolling kit to take home; 4-6pm; $50 per person. Saturday, February 9: Earth Winter Dinner Pop-Up at Ocean – Hosted by Chef Joe Schafer, this not-to-be-missed event provides a first taste of the of the 2019 Earth menu. The evening begins with welcome cocktails and appetizers followed by a three course dinner with plated appetizer, family style entrees, plated dessert and additional surprises. Tickets are $135 per person and include food, cocktails, wine pairings with dinner and gratuity; 6-9pm. Saturday, February 23: Tap Takeover & Beer Dinner with Banded Brewing Co. – Biddeford’s Banded Brewing Co. takes over the taps at The Burleigh. Chef Eric will serve light bites followed by a four-course dinner paired with four of the brewery’s most popular beers; 5-9 pm; $75 per person.